This year’s SABR convention was in New York, which was awesome for me, given how many of my research interests are New York-centric. It meant that I didn’t have to “pick out” all the Yankees-related topics to go see because there were so many. (Unrelated but cool: There were also so many women presenting and speaking that I didn’t feel compelled to prioritize them. How excellent.) The Yankees were out of town, but you could hardly tell there was so much Yankees talk. 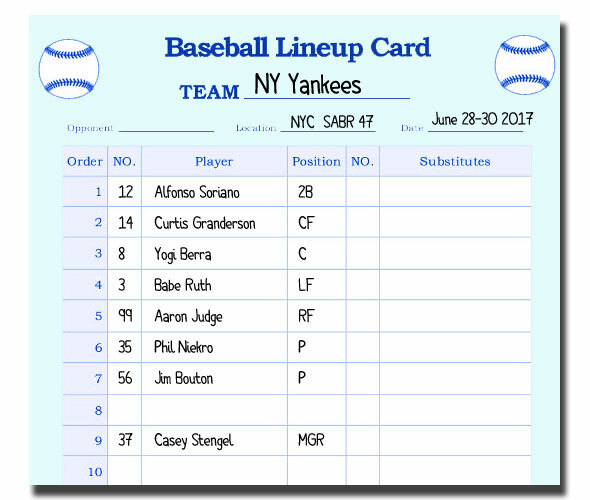 I learned a lot at this convention but I figured as a wrapup I could basically write a lineup card of things I learned about New York teams and players that I didn’t know before. Jean Afterman grew up in the Bay Area as a Giants fan, and was in her thirties working a kind of dead-end job in the sports-entertainment biz in Los Angeles when someone suggested she try something different. “A guy I worked with said, ‘you just seem too smart for what you’re doing,’ which was logging pitches on video and writing down the number of them and things like that. ‘Why don’t you go to law school? '” She took the LSAT and thought okay, now I’ll be a big-time entertainment lawyer. Don explained there was a deal between MLB and the Japanese leagues (NPB) to prevent Japanese players from playing in MLB. “Well, like any newly minted lawyer, I was like ‘that is not right, we should fight that! Restraint of trade! Hrrumph! '” As it turned out, the time was ripe to get involved in such a thing. Don had many contacts in Japanese baseball and Jean and he were soon in touch with Hideo Nomo. They found a loophole to get him to the U.S. and his debut was at Candlestick Park, Jean’s old stomping ground. There was also Hideki Irabu, who had been sold to the San Diego Padres without his permission, and who said he would only go to the Yankees. Jean was the one who negotiated with Steinbrenner and the Yankees–and the one who would get the phone calls during Irabu’s rocky career with the Yankees from Brian Cashman about whatever Irabu had most recently done wrong. 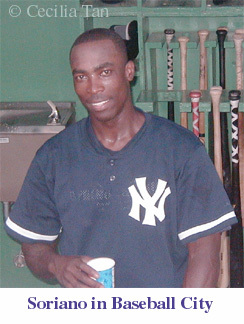 A photo I took of Alfonso Soriano in Yankees spring training back in 2002. Jean was being interviewed, by the way, by Claire Smith, this year’s J.G. Taylor Spink award winner. More on her later. Jean has been with the Yankees 16 years. Since Nomo crossed the Pacific to play in MLB, over 50 Japanese players have followed, 12 of them All-Stars (including Nomo). The Yankees are lucky to have cornered her fire, smarts, and talent. Once upon a time, the ballgame that the SABR convention attended en masse was in Arizona, and they witnessed a no-hitter. I wasn’t at that one. 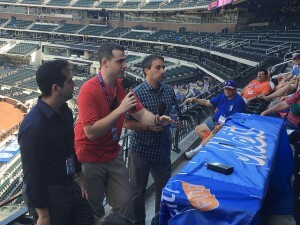 This time we were at Citi Field, where the Mets graciously hosted us with a program of speakers before the game, including their broadcasting team, a group of stats guys from their front office, and GM Sandy Alderson. Unfortunately this mentality didn’t help his eyesight during the SABR game. Jacob DeGrom had given up no hits through 4 and 2/3 innings. Five no-hit innings is an unofficial threshhold for starting to hope for an actual no-hitter. But a routine fly ball to center was lost in the evening sky. Granderson spread his hands like “I don’t see it.” Even though Cespedes raced over from left, he couldn’t stop it from falling untouched to the grass about twenty feet behind Granderson. The definition of a hit. Ah well. It was a lovely night at Citi Field anyway, and thank you to the Mets for being such fantastic hosts. It was Gelbs that told the Granderson anecdote. He repeated the story on air during the game – shortly after the lost fly ball in the 5th. The Mets broadcasters addressing the SABR 47 crowd at our pregame ballpark session at Citi Field. Photo by Jacob Pomrenke. One of the panels was on Yogi Berra and his legacy, not just as a ballplayer but as a national icon. On the panel we had not only Lindsay Berra–Yogi’s granddaughter and a writer for MLB.com and correspondent for the MLB Network–but also writers Harvey Araton (Driving Mr. Yogi) and George Vecsey (Baseball: A History of America’s Game), and the panel was moderated by Dave Kaplan, the former director of the Yogi Berra Museum and co-author with Yogi of When You Come to a Fork in the Road, Take It. What did offend him was that George Steinbrenner sent the pitching coach to fire him 16 games into the season instead of doing it himself. This began Yogi’s self-imposed exile from Yankee Stadium. Lindsay talked about being terrified to ask Yogi about whether she could go to a game at Yankee Stadium years later. Lindsay: Yogi also really embraced Jackie Robinson. He saw you were a good teammate or athlete. Rachel Robinson and he remained great friends after Jackie’s death and she was at his 90th birthday. Every time they saw each other, she would walk in and say “safe!” and Yogi would say “out!” and then they would hug and kiss. And she and I still do that sometimes. Lindsay’s a pretty pragmatic, down-to-earth Berra herself. You’d think I already know everything I could ever want to know about Babe Ruth. But like Yogi Berra, Ruth transcended baseball and became a figure in the American imagination. And unlike so many of the great athletes of the early 20th century who were American fixtures, but whose names and stories are being forgotten by 21st century culture at large–Jim Thorpe, anyone?–Ruth endures. I’ve long argued that Ruth is a patron saint in our national secular religion, a folk hero on par with Paul Bunyan and Johnny Appleseed. And here’s a bit more proof of that. 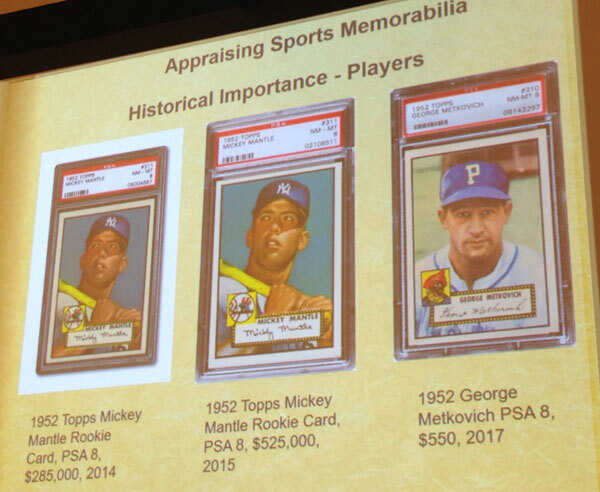 Leila Dunbar gave a fascinating and informative presentation on the valuation of baseball memorabilia. She’s an appraiser who used to work with Antiques Roadshow and is now an independent consultant. She walked us through the rubric of criteria used to assign value to an item as well as the different types of valuations: is it for an insurance company after an item has been damaged or lost? for an auction house prior to sale? for an estate valuation? Of all sports memorabilia, baseball is the most collected sport. Of all baseball memorabilia, Hall of Famers are worth the most, especially things connected with their greatest moments. Of those, a players’ autograph jumps in value after he dies (as the supply goes from infinite to fixed). An example she gave: Ted Williams’ signed balls jumped from $100 to $300-$500 the day after he died. And of all players, can you guess whose memorabilia is collected the most? Babe Ruth’s. It’s also worth the most, overall. People want their holy relics. Leila was also asked if Ruth is number one, what player is number two? I think most people were expected the answer to be Mickey Mantle (a Mantle rookie card in prime condition sells for millions of dollars, but it was actually Jackie Robinson, another of our patron saints and the subject of another panel at SABR 47. One other fascinating note: the memorabilia market took a hit during the crash of 2008. Then it rebounded not just because the economy for top earners started to rebound, but because some high rollers decided to put their money into purchasing memorabilia instead of stocks. Huh. Demonstrating the difference in value between Mickey Mantle rookie cards based on their condition, contrasted with a lesser known player. Presentation by Leila Dunbar. I already can’t remember (I’m typing this on the train back to Boston) why I had put Aaron Judge’s name on this list, other than you can’t seem to have a conversation about baseball with anyone these days without his name coming up. Oh, wait, I remember. There was a panel where Judge’s name came up, on The Future of Sabermetrics, moderated by Brian Kenny and featuring several people who are sometimes guests on his MLB Network analytics show: Joel Sherman (longtime columnist for the NY Post), Mark DeRosa (former MLB player), Vince Gennaro (president of SABR), and Mike Petriello (MLB.com writing and Statcast podcaster). There was much great discussion on this panel and I hope there’s a chance it gets uploaded to SABR.org later for all to see. A recurring topic was about how much players do–or don’t–utilize the information that’s available to them. Joel Sherman: The best organizations are melding this. It’s like baseball jazz and a lot of it is on the manager. … Buck Showalter is going to take the numbers from the front office and turning it into the notes that your 25 players can play. AJ Hinch will guard against the bunt because he knows he’s got a pitcher who can’t handle the open base even though the front office is telling him he shouldn’t do that. Mark DeRosa: But a lot is on the players. It depends on the guy and it depends on who you were raised by. Cjipper Jones didn’t like to do a lot before a game. He liked to sit in the clubhouse and play solitaire almost up until 6:45 and then put his uniform on and run to third base. He’s going to be a first ballot Hall of Famer. He was not memorizing numbers. But he knew how to break down video. He taught me how to break down video. It’s all about how you were raised. If I was raised by Hanley Ramirez I probably wouldn’t know how I hit against lefties. There are reams and reams of articles being written about Judge and the comparisons to Jeter are being made more and more. No one seems willing to write the words “next Derek Jeter” because that is both somewhat unfair to Jeter and to Judge and nobody wants to be “that guy,” but it’s being whispered. The outstanding character, the instant clubhouse leader, not bothered by fame, never wants to talk about himself and would rather praise his teammates, etc.–the comparisons to Jeter are inevitable. As Richmond wrote in the piece, each generation of Yankees “has featured one humble, homegrown baseball player possessed of enough grace to save the franchise’s dignity in the face of [Steinbrenner’s bombast]—men of no self-strut at all, but endowed with a innate sense of style that they’ve carried for their appointed terms and then passed on to the next bearer of the torch.” In the spirit of the quiet, home-grown Gehrig balancing superstar Ruth, as Guidry did Reggie, as Mattingly did Winfield, so came Jeter, and now Judge. George is gone but even without him as ringmaster, the Yankees themselves will always swirl at the center of a media circus. The Yankees have built a special box section called the “Judges Chambers” and the people who sit there wear judge robes and wigs, and in every ballpark he plays in, fans show up with “All Rise” signs. Judge seems immune to the hoopla. He’ll be going to Miami to represent the AL in the All-Star Game and the home run derby next week. I mentioned earlier that the great Claire Smith was speaking at the convention. She and umpire Perry Barber appeared as guest speakers at the Women in Baseball committee meeting, and she told this story in answer to an audience question about interviewing players. She related that the hardest interviews to do were often with an athlete who was approaching a milestone. While she was on the beat for the Hartford Courant, knuckleballer Phil Niekro was with the Yankees. She and another writer were assigned to interviewing Niekro when he was getting close to 300 wins. Niekro was the oldest player in baseball, the Yankees were in a pennant race, and he was losing start after start, stalled at 299 wins. He didn’t much want to talk to the media, but finally the Yankees PR staff got Claire and this other writer together with Niekro. “We were bombing out,” she said. “Every question, it was like pulling teeth. He was giving pat answers and clearly didn’t want to be there.” The two writers were eyeing each other like what are we going to do? Niekro was being as hard to pin down as his knuckleball. .
“Well, it’s because of my dad,” Niekro said. And that broke open the logjam. Niekro went on to tell them about how his father was in the hospital in West Virginia, possibly on his deathbed, and how much he wanted to win #300 for him. His father had taught him and his brother Joe the knuckleball. His father would come home in the evenings, exhausted from backbreaking work as coal miner, and his two young boys just wanted to play catch with him. And he would go out and play with them. Both Phil and Joe made it to the major leagues with the knuckleball and their father had listened on the radio to over 500 wins between the two of them. But right then Phil didn’t know if his father would even be able to hear him win number 300. Ultimately he did get that win, on the very last day of the season, an 8-0 shutout against Toronto. (You can read Claire’s game story from The Hartford Courant on that game here: http://articles.latimes.com/1985-10-07/sports/sp-16727_1_phil-niekro) After the game, his brother Joe came and told him that their father had been moved out of intensive care that day and that he’d heard the game. “They say there’s no crying in baseball but let me tell you, there was crying that day,” Claire said. And there was plenty of crying going on in the ballroom at the SABR convention as we listened to that story. Paula: But exposing the unfair labor practices led ultimately to free agency. Bouton: And they haven’t forgiven me yet. They talked about the incident when Bowie Kuhn called Jim into the league offices to dress him down about the book. Bouton: But yeah, they wanted to know what was I thinking. I was explaining myself, and they were telling me these things needed to be removed from the book. I had read it over right before the meeting to make sure everything I had said was true. There had to be a dozen or so guys outside the office with signs saying “Save Bouton, Save Ball Four,” and they had to usher those guys out. It just made a better story out of it. Jim Bouton may no longer have the sharpest mind in baseball, but he’s still a sharp wit. 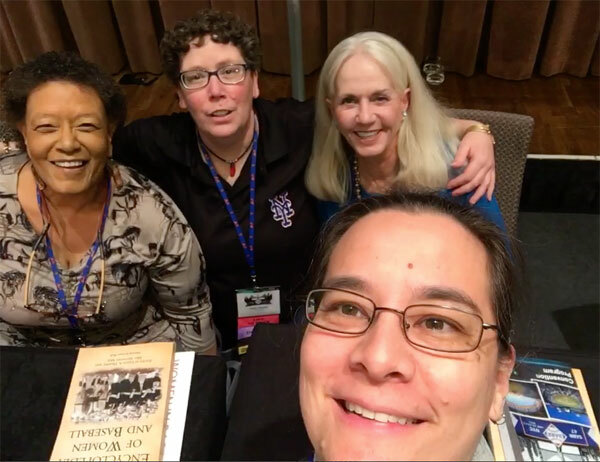 I think if a central theme or common thread emerged from all the presentation at SABR 47, it’s an emotional one. Nearly every panel had some kind of emotional resonance and so many of them on great figures of New York baseball history—Casey Stengel, Jackie Robinson, Yogi Berra, Jim Bouton—seemed ultimately about humanizing them and making an emotional connection. That might surprise some people who think SABR is all about numbers. SABR is actually all about understanding. Knowledge is built on many fronts: numbers are one tool but they’re not the only tool. Our connection to the sport is on many planes, including the spiritual and emotional ones, as we are connected to any human endeavor. We wouldn’t be so passionate about it otherwise. This was written by Cecilia Tan. Posted on Monday, July 3, 2017, at 7:06 pm. Filed under Baseball Fans and Fandom, Baseball History, SABR, Yankee Fan Memories. Tagged aaron judge, alfonso soriano, babe ruth, claire smith, curtis granderson, jean afterman, jim bouton, phil niekro, tom villante, yogi berra. Bookmark the permalink. Follow comments here with the RSS feed. Post a comment or leave a trackback.